In 1997 scholar and teacher R.C. Sproul was called to the pulpit of St. Andrew’s in Sanford, Florida. The published collections of his sermons, the St. Andrew’s Expositional Commentary Series, are the result of years of careful preparation and weekly, Bible-centered preaching. 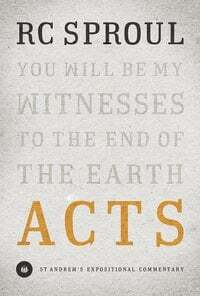 Crossway has just released the third book in this series: Acts. Readers will follow Dr. Sproul as he preaches through the book of Acts. The account of the gospel spreading to the Gentiles is the story of the roots of our faith. By God’s grace and the labor of Paul and the apostles, salvation has spread to all the nations. Balancing broad and narrow perspectives of each passage, Sproul explores important theological terms and themes, offers perspective from his own wisdom and experience, and engages in practical application. Delivered from a pastor’s heart for his congregation, readers will find Acts readable, applicable, appropriately paced, and thoroughly Bible-centered. Here is an opportunity to sit at the feet of an eminent theologian and teacher, encountering the Word of God. Also available in the St. Andrew’s Expositional Commentary Series are Romans and John.